Pavlova is a meringue-based cake named after the Russian ballerina Anna Pavlova. It is a meringue dessert with a crisp crust and soft, light inside, usually topped with fruit and whipped cream. The name is pronounced /pævˈloʊvə/, or like the name of the dancer, which was /ˈpɑːvləvə/. The dessert is believed to have been created in honour of the dancer either during or after one of her tours to Australia and New Zealand in the 1920s. The nationality of its creator has been a source of argument between the two nations for many years. In 2008, food anthropologist Professor Helen Leach published The Pavlova Story: A Slice of New Zealand's Culinary History, in which she posited that the earliest known recipe was published in New Zealand. Later research by Andrew Wood and Annabelle Utrecht suggested the dessert originated in the United States and was based on an earlier Austrian dish, Spanische Windtorte. Helen Leach, in her role as a culinary anthropologist at the University of Otago in New Zealand, has compiled a library of cookbooks containing 667 pavlova recipes from more than 300 sources. Her book, The Pavlova Story: A Slice of New Zealand's Culinary History, states that the first Australian pavlova recipe was created in 1935 while an earlier version was penned in 1929 in a rural magazine. From similar historical records as Helen Leach, Michael Symons, an Australian then researching in New Zealand, has declared that the pavlova has no singular birthplace. Rather, published recipes reveal the complex process of “social invention” with practical experience circulating, under a variety of names, across both countries. 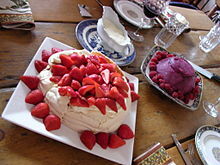 For example, Australians beat New Zealanders to create an accepted pavlova recipe as the “Meringue Cake”. The illusion of some singular invention can be explained by distinguishing a second, associated level of “social construction”, in which cooks, eaters and writers attach a name and myths to produce a widely-held concept that appears so deceptively distinct that it must have had a definite moment of creation. Pavlova has a crisp and crunchy outer shell, and a soft, moist marshmallow-like centre, in contrast to meringue which is usually solid throughout. It has been suggested the addition of cornflour is responsible for the marshmallow centre, although it has been debated that the cornflour is just another egg white stabiliser in addition to the acid. The consistency also makes pavlova significantly more fragile than meringue. Because pavlova is notorious for deflating if exposed to cold air, when cooking is complete it is left in the oven to fully cool down before the oven door is opened. “The pav” (short for ‘pavlova’ used in New Zealand and Australia) is popular on Christmas Day as a dessert usually served after being refrigerated due to Christmas being celebrated during the summer in the southern hemisphere. Te Papa, New Zealand's national museum in Wellington, celebrated its first birthday in February 1999 with the creation of the world's largest pavlova, named "Pavzilla", which was cut by the then-Prime Minister, Jenny Shipley. This record was broken by students at the Eastern Institute of Technology in Hawke's Bay, New Zealand, in March 2005. Their creation 'Pavkong' stretched 64 metres long in comparison to Te Papa's 45-metre-long pavlova. In August 2010, chef Aaron Campbell displayed a 50-square-metre rugby-themed pavlova, with the Bledisloe Cup in the centre, in the ChristChurch Cathedral in Christchurch, to raise money for the official charity of the All Blacks. In 2007, insurance company NZI ran a humorous series of television advertisements in New Zealand highlighting what are locally considered to be historic New Zealand icons being adopted elsewhere, including the pavlova playing on its status as a common feature of the friendly Trans-Tasman rivalry. NZI's parent company is Australian-owned. Leach, Helen M. (1997). "The pavlova cake: the evolution of a national dish". In Walker, Harlan (ed.). Food on the Move: Proceedings of the Oxford Symposium on Food and Cookery, 1996. Devon, England: Prospect Books. pp. 219–223. ISBN 0-907325-79-3. ^ a b Boylen, Jeremy (reporter) (2004-08-20).Pavlova George Negus Tonight, Australian Broadcasting Corporation. ^ a b c d e f Leach, Helen (2008). The Pavlova Story: A Slice of New Zealand's Culinary History. Otago University Press. ISBN 978-1-877372-57-5. ^ Dictionary.com, "pavlova", in Dictionary.com Unabridged (v 1.1). Source location: Random House, Inc. http://dictionary.reference.com/browse/pavlova. Available: http://dictionary.reference.com. Accessed: 26 April 2009. ^ a b "Pavlova research reveals dessert's shock origins". Good Food. Retrieved 2015-10-31. ^ "Pavlova, History of Pavlova". WhatsCookingAmerica.net. 1935-04-02. Retrieved 2010-11-16. ^ "'Australian Flavour', Pavlova Time Line". AustralianFlavour.net. 2007-11-08. Retrieved 2010-11-16. ^ See, for example, M. Symons (1982) One continuous picnic: a history of eating in Australia. Adelaide: Duck Press. ^ "An Elaborate Cake". The Advocate, republished by Trove, National Library of Australia. 1935-09-14. ^ "These are... OUT of the BOX!". The Australian Women's Weekly. Australia: National Library of Australia. 10 July 1937. p. 39 Supplement: 16 Pages of Cookery. Retrieved 6 January 2011. ^ "Antipodean palaver over pavlova". BBC News. 2005-07-19. Retrieved 2009-07-17. ^ "IN THE PAPERS". The Argus. Melbourne: National Library of Australia. 17 November 1928. p. 5 Supplement: The Argus. Saturday Camera Supplement. Retrieved 6 January 2011. ^ "Pavlova Recipe". Elise.com. Retrieved 2010-11-16. ^ "Traditional Pavlova Recipe". foodtolove.com.au. Retrieved 18 May 2016. ^ "How to Make Perfect Pavlova and Meringues". Foodlovers.co.nz. Retrieved 11 July 2014. ^ "Contains Pavlova Toppings". InMamasKitchen.com. Archived from the original on 2010-12-05. Retrieved 2010-11-16. ^ "Students make world's biggest Pavlova". The New Zealand Herald. 2005-03-21. ^ "Charitable Kiwi chef whips up giant pavlova". NewZealand.com. 2010-08-06. Retrieved 2010-11-16. ^ "Complaint 06/153". Advertising Standards Complaints Board. 2006-05-19. Retrieved 17 November 2010.